The McIntosh apple was discovered here at Smyth’s Orchard. 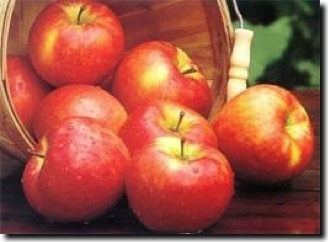 The McIntosh style is typified by attractive dark red or (more often) crimson colours, and a crunchy bite, often with bright white flesh. The flavor is simple and direct, generally sweet but with refreshing acidity, and usually a hint of wine - often referred to as "vinous". In general these apples keep reasonably well in store. 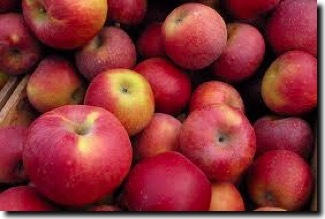 Honeycrisp, or Honey Crisp, is a modern apple variety, developed in the 1960s and introduced to the market in the 1990s - sometimes trademarked as Honeycrunch. Honeycrisp is a medium-to-large sized apple, with a light green/yellow background largely covered with red-orange flush with strong hint of pink if grown in good sunlight. The skin may be flecked with occasional russet dots. The flesh is white, perhaps not quite as bright as a McIntosh style apple, but similarly crisp and not too dense. The colour however can be quite variable. The flavour is sweet with very little trace of acidity and little depth or complexity. There can also be a trace of pear-drop flavour. In a good example this is a juicy and instantly refreshing apple, in a less good example it will be simply sweet and bland (but still very nice). As its name suggests this is genuinely a crisp / crunchy apple. However since the flesh is quite light, the crunch is surprisingly soft, nothing like the hard crisp crunch of a good Golden Delicious.